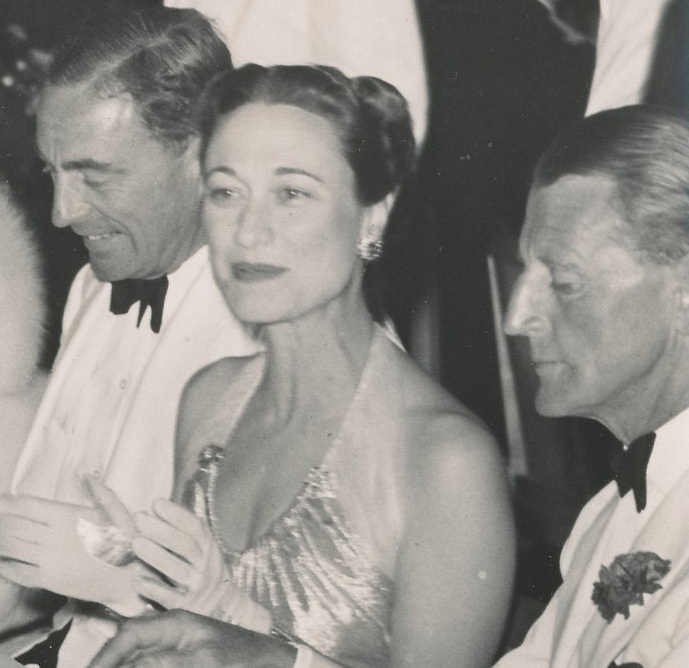 Wallis, Duchess of Windsor, Cannes, 1939. I came across this photo of the Duchess of Windsor that I’d never seen before while searching for something else. The caption said it was taken in Cannes, 1939. It’s the most glamorous picture of Wallis I’ve ever seen! I don’t think she photographed particularly well most of the time but in this picture she looks quite nice. I think that is Fruity Metcalfe on the right, who was Best Man at wedding of Wallis and David on June 3, 1937. I believe that is Herman Rogers, one of her good friends from her days in China, on the left. As to the earring I spy on Wallis, I’m seeing a cluster earring of the type she favored and wore so well—usually with a colored gemstone surrounded by diamonds. I’ve looked through the Sotheby’s catalogue from the 1987 auction of her collection and found one of her earrings that it could be—a step-cut emerald with clipped corners surrounded by navette diamonds, mounted by Cartier. The catalogue does not give a date for the earring and the notes state only one was available to bid on in 1987—the other was part of the lot (Lot 77) but included the mounting alone, the stones had been removed. Probably to make another piece of jewelry! 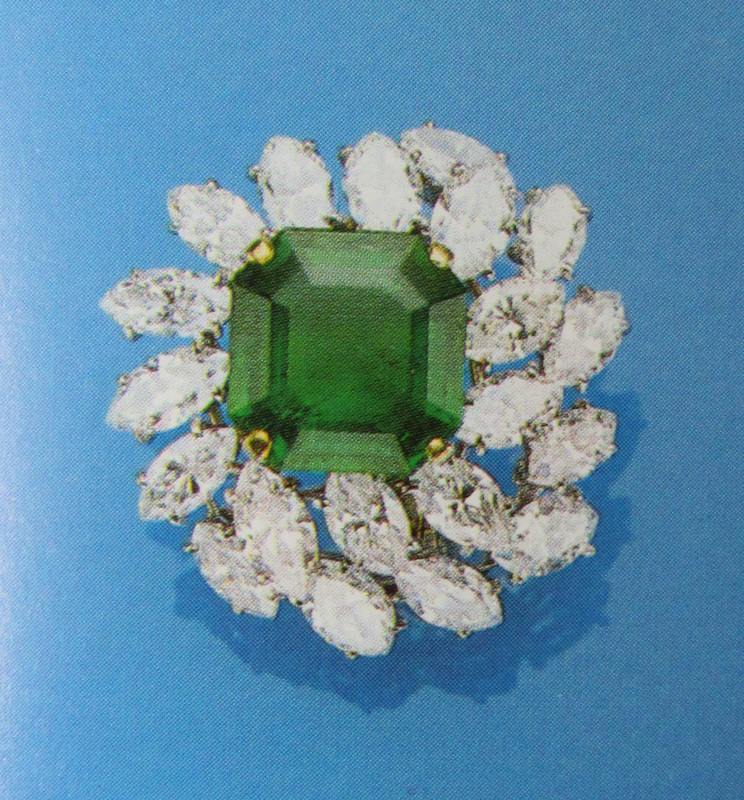 From the 1987 Sotheby’s catalog. 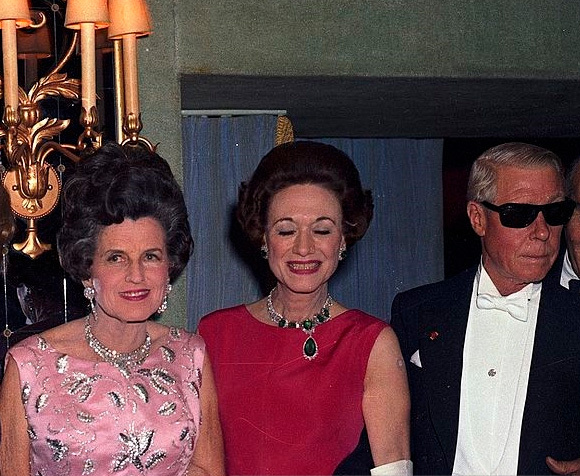 This 1967 picture of Rose Kennedy, Wallis, and David in his shades and tux makes me laugh! Photo by Bert Morgan. Could the earrings she wore in 1939 be the same pair of earrings she wore in this photo from 1967 with Rose Kennedy and the Duke? Or were the 1939 earrings part of the cache stolen from her in 1946 during a robbery at Ednam Lodge, a country estate in England? It is so hard to tell from the slightly blurry black-and-white photograph if they are the same pair. If you have information let me know in the comments section. I wonder if the person who bid on the remaining earring (and the empty mount of the other) back in 1987 removed the stones to make a new piece of jewelry, had new stones put into the mounting to have the earrings made into a set again, or converted the sole surviving earring into a one-of-a-kind pendant with a historical provenance! I would have the single earring made into a pendant or brooch I think. How about you? That is her best pic ever and also hadn't seen it...and there's old Fruity Metcalfe; where have you been Old Boy? !...haven't seen you since our days in Mesopotamia...goodness how the years fly by.